I love scarves. They are my tried and true fall accessory. They are my statement necklace for the season. The only downfall is the weather in Texas. It is so hit or miss. It's hot. It's cold. It's warm. It's cool. You just never know. I have been itching to bring out all of my scarves, but it's still a little warm to wrap and tie them around my neck. So, I decided to just to drape it over my vest. Duh. Why haven't I done this sooner? I will find ways to incorporate my fall attire regardless of the warmth. As much as I love summer, I am ready for my boots, scarves and layers. Since I live in Texas, I have gotten quite creative with looking like I live in cooler temperature states without sweating my bohunkus off! Anyone else feel me out there? I know you SoCal gals are experiencing steamier temps than we are! P.S. I am over at Leeann's blog talking about statement shoes. Yes, statement shoes. And there is a HUGE giveaway over at Sharon's blog. Make sure to hope over to both! 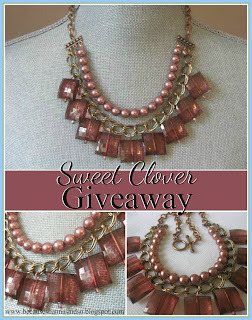 Have you entered the Sweet Clover necklace giveaway yet? Go here for your chance to win! Plus get the code to save 20% your order! I really love that outfit! Especially those boots! This outfit is absolutely adorable! I love what you did with the scarf. Love the boots too! Shanna, this may be one of my favorite looks you've ever done! I looove it, love it, love it. and I NEED those boots in my life. Ohhhhh super cute boots, great background too! LOVE this outfit girl!!!! I'm totally in love with those boots and that vest. XO! Great outfit! Love the boots. Your post is making me want to pull out my scarves and start wearing them! I never would have thought to tie knots on the ends of a scarf and just drape it! Always thinking!! Love this look, the neutrals are so nice. Yes, I'm in love with scarves as well. The NC weather seems to be the same....50 one day, 90 the next. It will be straight up fall one day!! LOVE this outfit! The riding boots and vest are perfect! Plus, you always find the best places to take pictures! Love those boots!!!!!!! GAAHHHH! And what a cute way to wear a scarf! i am in love with those boots! and I'd like you to pick out my outfits every day! Your boots are SO cute with the detailing in the back. And totally jealous of everyone that has that cargo vest. Please send your warm weather back to Jersey. It was 70 on the weekend which was heavenly but now it's chilly again. I heart vests!!! Love those boots too! Francesca's is my Mecca. We have two, and one is way better than the other. I must go find boots like that. I love what you did with the vest and scarf here! This is so cute! A great way to incorporate fall stuff in crazy hot weather. I want to replicate this look ASAP! Love the fall colors! How creative are you knotting the ends of your scarf like that?! That's such a cute idea. I love your vest too! Ack! I love those boots. You are sickeningly cute! I'm so jealous. Cute as always! I love doing that with scarves or draping them around my neck and tying with a belt! Love the setting for these shots! This outfit is adorable!! !You are too cute! I am in LOVE with this look!! Great vest, great scarf, fabulous pics... and those BOOTS!!! I love everything about this! You look gorgeous! Love the scarf and love it draped like that. It was 40 degrees one night over the weekend here in Boston. I will gladly trade temperatures with you! I love it! I wish that vest was still available at Old Navy... I have been searching for a similar one and can't find it :( You look great, as always! I love the look of the scarf draped over the vest, I'm trying this for sure! The weather here in KS is so odd too--it was cold and rainy this weekend but getting up to 80 today! Now why in the heck did I never think of this???? Awesome idea with the scarf. I will definitely be doing this ASAP! Great Fall outfit! And I love the way you incorporated the scarf! Stop it. Just stop it! Stop being so fashionable and wearing all the outfits that I would wear. We really are fashion twins! And scarves are my absolutely favorite accessory. It's rare that I leave the house without one. Even in the summer :) Just love that outfit, doll! Love this!!! Especially those boots! I so wish I had a Francesca's near me! Going to check out your shoe post now! Love the layering in this outfit and love the red sippers on your boots! Newest follower here! Cute blog, I can't wait to read more! I'm with you! Fall needs to get here soon! We had a couple days of weather in the 70's and then it's back up to nearly 90. You look amazing! I love your boots! This outfit looks awesome on you! You are so cute. love, love, love that vest! I am dying to find one for myself! I love scarves year-round... and with some sneaky tricks (linen scarves, careful draping) they really can add some pizzaz to outfits most months of the year (well at least here in Nashville, TX gets a little hotter!)... this is a genius way to rock scarves before the Fall chill really hits... Love it! I wish I got that vest in that color! I get jealous every time you wear it because you always look so stinkin' cute! I'm obsessed with your boots!!!! They are amazing and I need them! Love this outfit! I LOVE this outfit and am LOVING your blog!! I LOVE those boots! I also love your backdrop for the photos today. I love railroad tracks. This outfit is perfect! Love the vest, boots and scarf!! Where are your favorite places to buy scarves? I always find it is hit or miss and I would love to find that one store that I can count on! Shanna, you look wonderful and I love the idea of just draping a scarf like that instead of bundling up when it's not that cold. Minnesota definitely is bundling up kinda weather already so I'm trying to find new ways to tie them around my neck. I absolutely love your outfit, the train tracks, and your blog! I am now following you! This is a fab.you need to get on the train to here. I love the vest and boots--gorg! Another fave outfit girl! I WANT THOSE BOOTS.... LIKE, RIGHT NOW! So cute! I love this outfit!! Your vest is fabulous. I'm obsessed w vest & scarfs!! Seriously tho this heat wave is killing me. I want to wear my boots! I love yours. I love the gold jewelry with it too. Not too much just the perfect amount. And I loveee this background. Goes perfectly with the outfit! What a fun outfit! And these pictures are amazing!